Ace Cloud Hosting had the honor of talking to Geni Whitehouse. She is an accounting profession influencer known for her business ‘Even A Nerd Can Be Heard’ in which she has been guiding CPAs and accounting professionals to add more value through better communication. Her book, entitled “How to Make A Boring Subject Interesting: 52 Ways Even a Nerd Can Be Heard”, is designed to help accountants do just that. A former partner in a CPA firm, wine industry consultant and keynote presenter, Geni is also passionate about helping accountants transition from their more traditional roles to becoming a proactive advisor to their clients. In an interview with Ace Cloud Hosting, she discussed the changes that are occurring in the client-CPA relationship and how accountants can address these challenges. With ‘Even a Nerd Can Be Heard’, you are doing a great job at helping accounting professionals and clients communicate better and be transparent. How does better communication impact the accountant-client relationship? Geni Whitehouse: When clients don’t understand the information we share, they both undervalue it and can’t apply it to their business. They may understand that getting a tax return done or having an audit are important activities (because someone has required them to do so) but that doesn’t mean the resulting deliverable is relevant to them or their business. When accountants are able to share information in a way that makes it understandable, relevant, and actionable, their clients have a far greater appreciation of both the information and the accountant who delivers it in a meaningful way. Accountants join this profession to serve. When they are seen as partners with their clients rather than as agents of either the taxing authorities or the accounting standards board, it changes their relationship with a client. The intrinsic rewards from helping a client achieve their business goals are immeasurable. How does transparent accounting increase an accountant’s perceived value in the eyes of their clients? 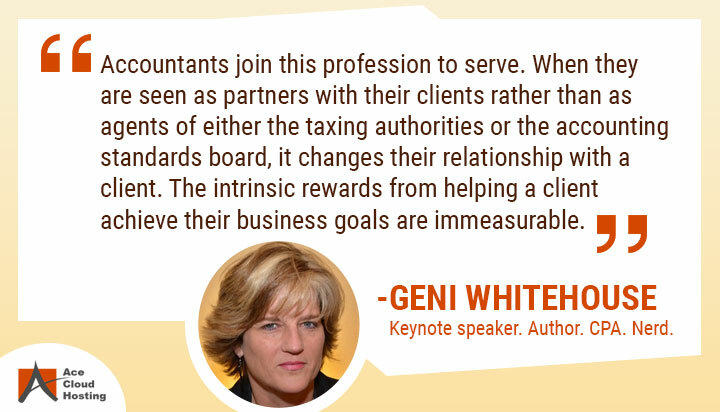 Geni Whitehouse: When we accountants successfully shift the focus of our work and our communication from showing how much we know to empowering the client to apply all of his or her expertise in a new way, we both benefit. We shift from being seen as intimidating experts to partners working with our clients on a common goal. The client is enlightened and no longer feels overwhelmed by the demands of his role. This kind of relationship has far greater value. So, we can summarize that accountants should focus on being a business advisor? Geni Whitehouse: It is pretty clear that today’s clients are seeking a different type of advisor. They have more questions than ever before and are struggling to make sense of the volume of information that is readily available in their business. If accountants do not provide the kind of insight they seek, clients will turn to others for help. Are there any DOs and DON’Ts for accountants seeking to become better business advisors? Geni Whitehouse: Do not presume to know more than your clients. They are the experts in their own business. Our role as accountants is to ask different questions so that these knowledgeable owners can see their own results in a different light. Our role going forward will be to translate and facilitate and not just tic, tie, and document. With clients and accountants being more receptive about adopting new technology, how have the challenges changed for them? Geni Whitehouse: Our clients are far more receptive to new tools that help them accomplish more in less time than we are. Many company leaders are wired for innovation and risk-taking, while accountants are just the opposite. We have a tendency to wait until there is zero risk. It is our job to seek out new ways of assisting our clients, and we must therefore be knowledgeable in both technology and new disciplines as they arise. Everyone, whether client or accountant is being challenged by the sheer pace and volume of technical change and by the volume of data (both big and small) that is available to us. It requires focus and discipline to keep moving in the right direction. New visual display tools and dashboards that simplify the work of turning data into insights will be the tools of choice for accountants going forward. Do you have a step-by-step guide to solving this challenge? Or is there any must-have technology/product/service to become an accounting nerd who is really heard? Geni Whitehouse: I follow a methodology from Mentor Plus that offers tools and insights at each stage of the client relationship – across a total of five different levels of services. The training in this methodology teaches accountants how to make changes in their mindset, skillset, and toolset. While technology is rapidly evolving, the accounting profession is lagging behind. In many cases, our key internal applications (like time and billing, tax software, and engagement working paper solutions) are still written for the desktop and are not cloud enabled. Rather than remaining chained to our desktop, however, we can work with skilled hosting providers like Ace Cloud Hosting who provide a secure, high-performing hosted environment that offers us the benefits of cloud performance without the need to learn new applications or deal with complex IT challenges. And while the technology is important for the accounting profession, it is even more important that we have access to competent support professionals who understand our applications and respond immediately to any support issues that arise during our busiest time of year (January to April). What is the biggest concern with this technology among clients? And how do you address their concern? Geni Whitehouse: The biggest concern our clients have, which is shared by us accountants, is how to keep up when we have limited time to get everything done. It can feel a bit overwhelming just trying to keep our smartphones up to date. It gets even worse when you consider all of the apps that are appearing on the scene daily. Just visit the Ecosytem provided by Accountex and count the apps. The rapid pace of technology requires us to pay attention so we can learn as much as possible about new solutions for our clients. Do you find some accountants worried that automation could hurt their job, client retention, or paycheck? Geni Whitehouse: It is hard not to be worried. Everywhere we turn, someone is talking about the number of jobs in accounting that will be eliminated by automation. The opportunity, however, is for us to move from delivering the mundane, repetitive work to the more creative, original, strategic services that our clients want – things like improving their sales results, training employees on financial concepts, connecting actions with outcomes, managing cash flow, budgeting and forecasting, creating dashboards and Key Performance Indicators (KPIs) that provide meaningful insights. These are all skills that I have learned as a Level 5 Certified Advisor from MentorPlus.com, which I have the honor to apply in my work with winery clients in the Napa Valley. As a cloud solutions provider for the accounting industry, how can Ace Cloud Hosting be part of this transition/journey of CPAs from becoming Trusted Business Advisors? Geni Whitehouse: By freeing accountants from their desks, you have given them a new opportunity to interact with their clients on a regular basis. You have freed them to share documents online and to create processes that empower their teams and their clients. Your secure, controlled environment also makes it easier to support staff who might be comfortable working on their own devices, from their own homes, on their own schedule. The added benefit is that accountants are not forced to move their clients from desktop applications that they know and love in order to take advantage of the cloud environment. Everyone wins.